Here’s your resource for creative ideas to refashion smaller amounts of beef that aren’t enough for a meal on their own. Some types of beef are easy, others can be more of a challenge to reheat. If tough or dry, simmer it gently with water or stock until you get luscious shreds, then use. Look at those leftovers in a new way; as a building block for marvelous meals; as a shortcut, especially any that rely on an already cooked ingredient. All you need is the inspiration & maybe a recipe. To stretch a small amount of leftover beef (and many times, food made with beef) serve in, over or under something. If you’re starting out with something large, like a roast, you may have plenty of leftovers to work with. If making individual steaks, think about cooking an additional one just for leftovers. Here are some ways to get creative, from everyday simple to more of a project. I’m sure barely scratched the surface, but before we start: Sandwiches are a no brainer way to use just about any type of leftover beef. Pot roast makes a great sandwich, steak does, and any roast, thinly sliced is perfect for a French dip or Philly Cheesesteak. Just about any beef can be tossed in a soup, made into a stroganoff (drop it in towards the end to just heat through), or dropped in a hash or added to curry. A no-brainer. Wraps can be as basic or as decadent as you’d like and limited only by your imagination. These Cheesy Beef Wraps from the Genius Kitchen are calling my name. About any leftover beef can be made up into a bowl, but steak & roast beef really shine. Bowl ideas can be pulled from so many cultures & beef is easily stretched with veggies, grains, rice, noodles and/or beans. 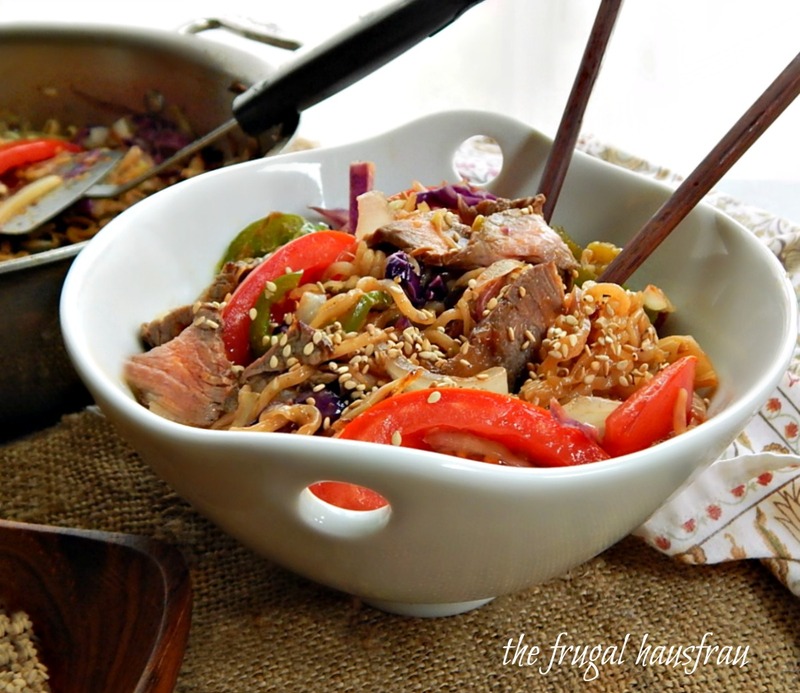 How ’bout my Mongolian Barbecue Noodle Bowls? If you just have a little beef and want a burrito, you’ll probably need to stretch it with veggies, rice or beans. Quesadillas generally use only a bit of beef and might be as simple as beef & cheese or include just about anything you’d like to toss in them. Fried Rice seems to be a go to leftover meal for all kinds of bits of this and that. Just use leftover steak or roast in any recipe. This Pork Fried Rice is every bit as good made with beef. Normally, we think pork for tamales, but try beef. Simmer leftover beef with the spices (if it’s not a soft one like pot roast, simmer until it breaks down) and proceed with the recipe. Gotta love Rick Bayless for anything Mexican. This Beef Hand Pies recipe look scrumptious, easy and a little chi chi. Hey, even we frugal people need a little chi chi now and then! Chimis are always good and can be made so many ways! Here’s my favorite Steak Chimichanga with a Chili Verde Sauce. I’m drooling over these Cheesy Beef Egg Rolls by Family Fresh Meals. And I love making these Wonton Appetizer Cups. Ground, any shredded or finely sliced beef will do for most. Empanadas don’t need a lot of beef. Two cups of leftover roast will do the trick. My Chipotle Pork Empanadas can just as easily be made with beef. Cornish Pasties can be made with rare steak or roast. Soup. Think Shortcut Beef Pho. Then there’s the old-fashioned Slow Cooker Steak Soup. And my Beef Barley can be made with leftover pot roast. There are a few no-brainer ways to refashion beef to top something. Make a sandwich, add to a grilled cheese, panini or use in a French dip. There was a time the thought of steak salad left me as cold as that icy chilled salad, itself. Then I got creative with this Southwestern Steak Salad and this California Steak Salad. Yum. This was my Mom’s deal. If the gravy’s leftover it saves you a step. If not save the drippings to make a quick gravy. Cube the leftover roast and simmer it in gravy & serve over mashed potatoes. Ok, so the original was made with leftover pork ribs, but it would be just as good made with beef ribs or a roast. Save the drippings and add beef stock to make up the difference. Almost a no brainer! Add any kind of taco or fajita seasoning to a shredded beef. Steak needs a bit of care in reheating. Try my Simple Steak Tacos. Yes, Virginia, there is a beef pizza! Use thinly sliced steak or roast to make a Philly Cheese Steak Pizza. Recipe from the Little Spice Jar. They’re little Venezuelan sandwiches. Knock hours off the time by starting with leftovers; just scale the recipe cook until shreddable in the spices in this recipe by the Candid Appetite. How about a home-made version of Beef on Weck (they’re marvelous sandwiches) starting with your leftover roast beef? Make with your leftover bbq beef or cook your leftover steak or roast until shreddable and add barbecue sauce. Then proceed with this recipe from Curlys. Make these spectacular Steak Nachos from Delightfully Made or improvise with leftover pot roast. Toss it in a pan with a bit of water & add a little chili powder, cumin, maybe some garlic or onion powder and cook until softened. Here’s a fantastic rendition of Beef Gravy Poutine from Seasons & Suppers. Made with broth, but add in a little thinly sliced roast or steak just to beef it up. When I think of leftover beef topped by something, I can’t help but think of shepherds and pot pies. Top with mashed potatoes, pie crust, biscuits or puff pastry for a filling. The Spruce has a Shepherd’s Pie made with leftover roast beef & topped with mashed potatoes. Shepherd’s Pie might be a no-brainer, but why not make it a marvelous one? Start with leftover roast for these Beef & Guinness Pies and add it in at the end just to warm up before proceeding with the Puff Pastry topping. OMG good.. Yet another pie. This one from Allrecipes and topped with a home-made pie crust. Stretch it with leftover roast and a few other vegetables. So I hope this gave you some fun ideas for leftover beef! If you’d like to return the favor, I’d love to hear what your favorite leftover recipes are! This entry was posted in Click here for Fabulous Food Posts and tagged Beef, Frugal Hausfrau, lefltovers, leftover beef. Bookmark the permalink. I know – Judi, even my leftovers have leftovers! And don’t get me wrong, I love them, but during the holidays there gets to be a point that I just divide what’s left up and freeze it! Just coz I want something fresh and vibrant! Happy New Year Mollie! Don’t you just love leftovers? Thanks for the ideas. I DO – I know some people don’t and I just don’t get that! 🙂 Happy New Years to you, too! I’m getting hungry just looking, and I’ve already eaten most of them, lol! !